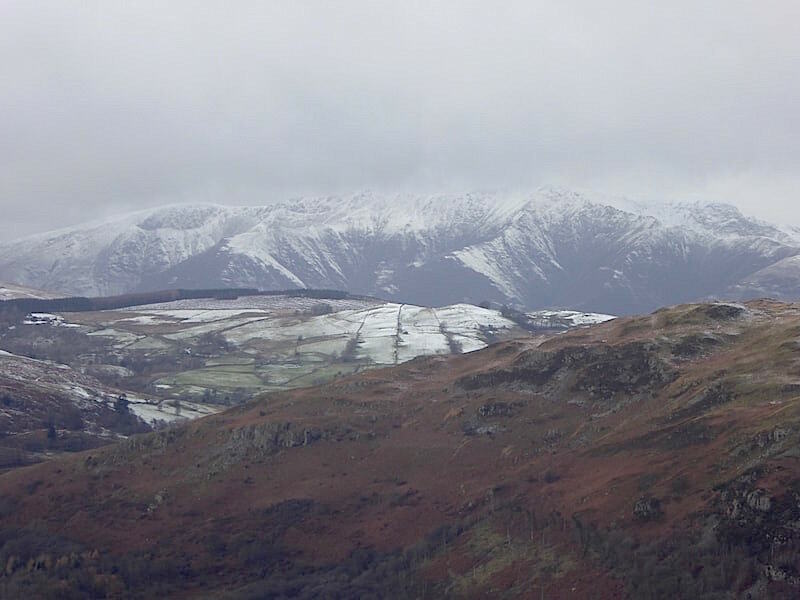 During a couple of journeys to and from Penrith yesterday we could see that a good covering of snow had fallen overnight on the Pennines and the Cumbrian fells. 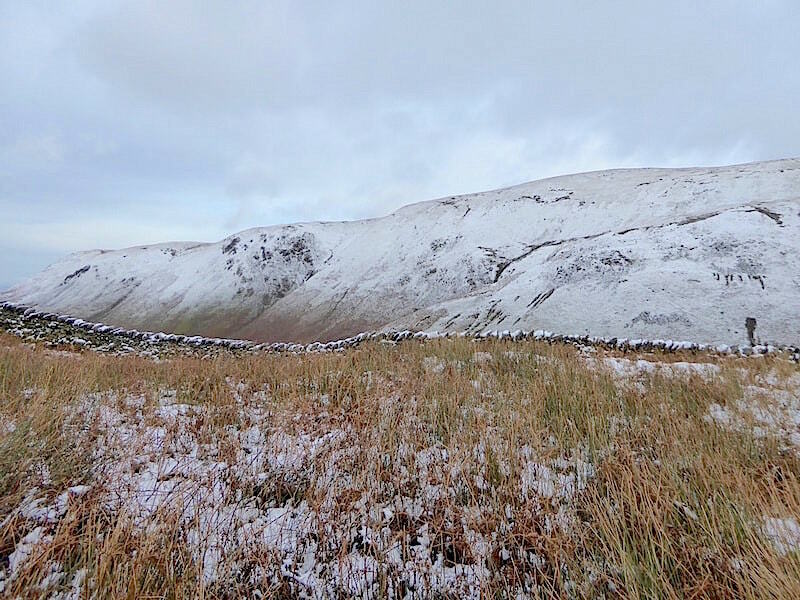 Across the Eden Valley, on the Northern Pennines, Cross Fell and its neighbours looked superb in the early morning sunlight and in many parts the snow was practically down to valley level. 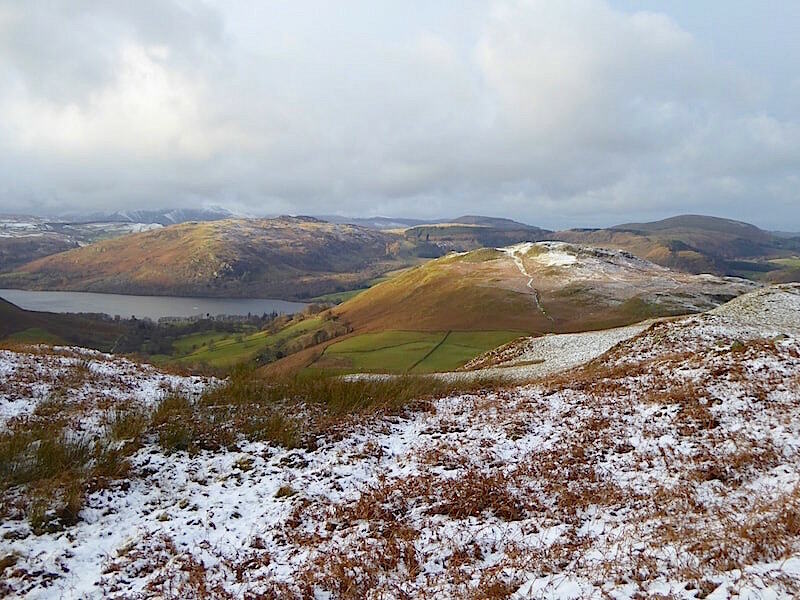 The snow covered fells to the west of Penrith had great quantities of cloud boiling around their tops and consequently weren’t standing out quite so well. 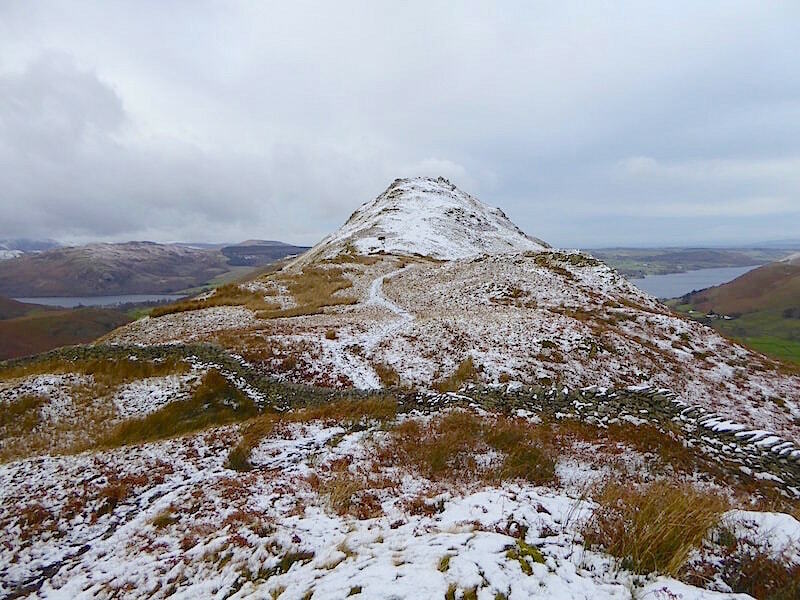 Returning from our second trip to Penrith we drove home in hail which settled on the ground very quickly, followed by overnight snow which, by this morning, had left a thin layer on rooftops, pavements and cars. 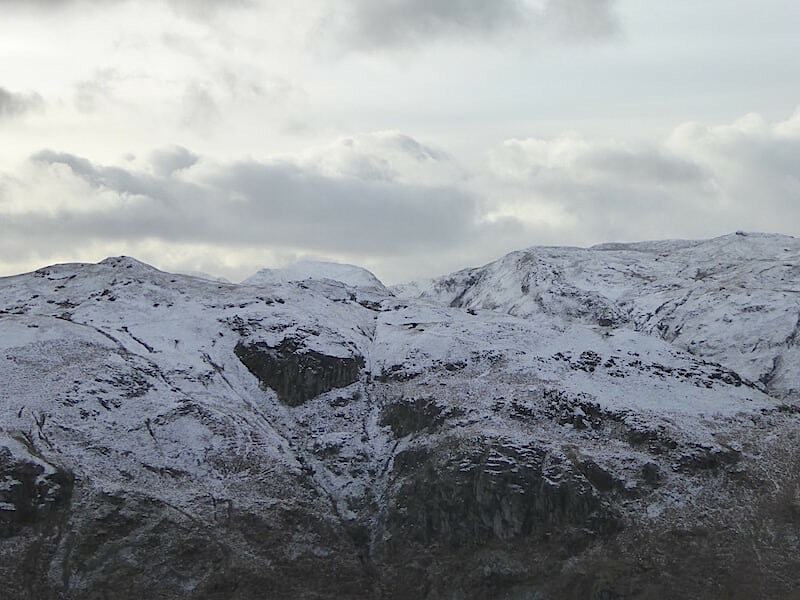 The morning started out bright and sunny but by midday cloud began rolling in and it seemed as though more snow showers might be on the way. 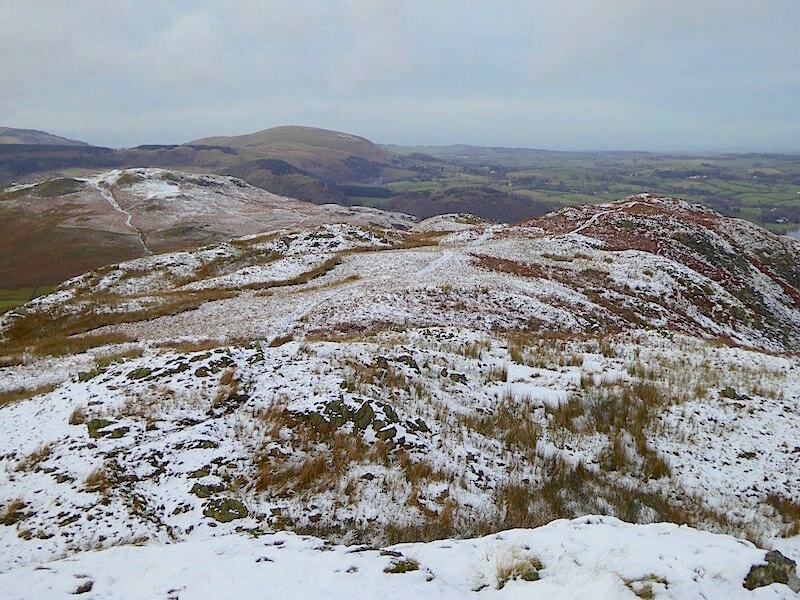 We weren’t able to take advantage of the earlier sunny morning, having other things to deal with, but decided to use what remained of the afternoon to take just a short walk up Steel Knotts. 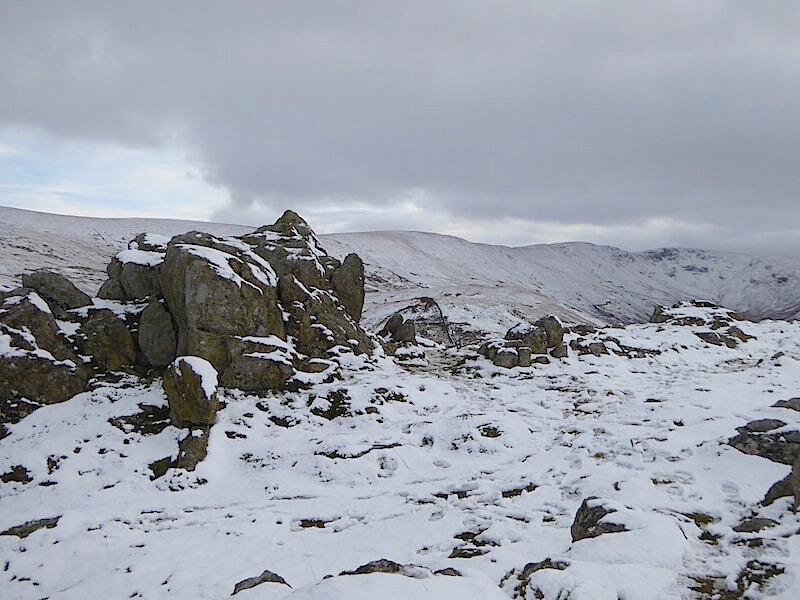 We didn’t experience any snow showers but the heavy cloud persisted, which made for very dull lighting conditions, and the strong north westerly wind kept the temperature well down. 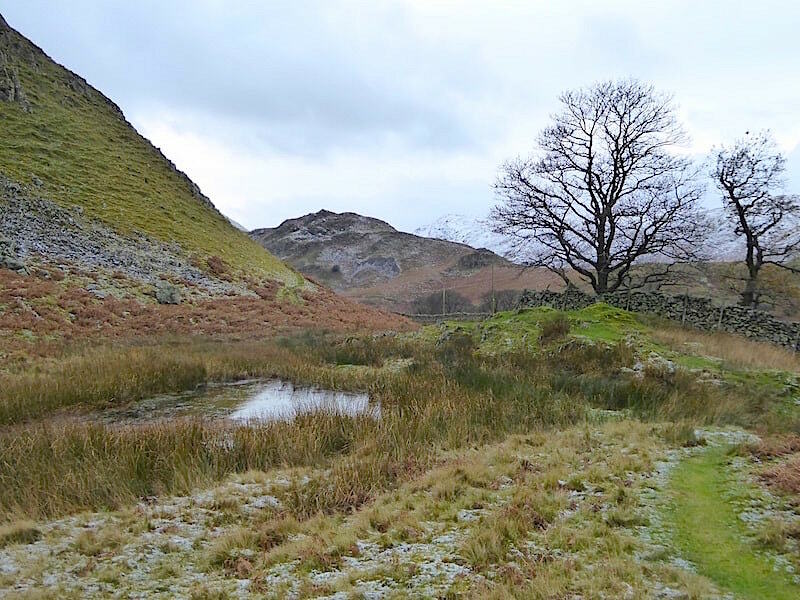 We met no cars at all as we drove from home to Howtown, and there wasn’t a parked car anywhere on the few parking spaces available below Hallin Fell. 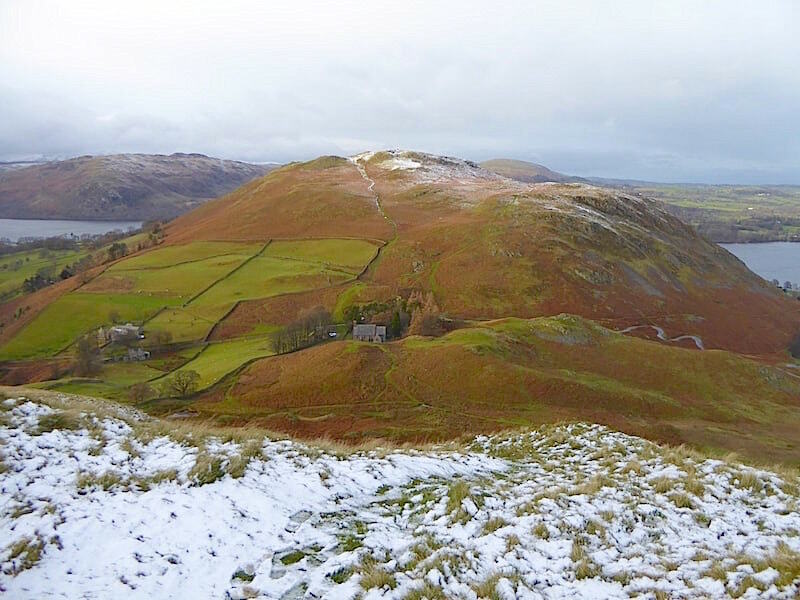 We had intended to leave the car at the bottom of the Howtown hairpins but when we arrived we could see that the road was snow and ice free so we continued on up to the Hallin Bank Hause, again meeting no-one coming down, and parked up beside St Peter’s Church. 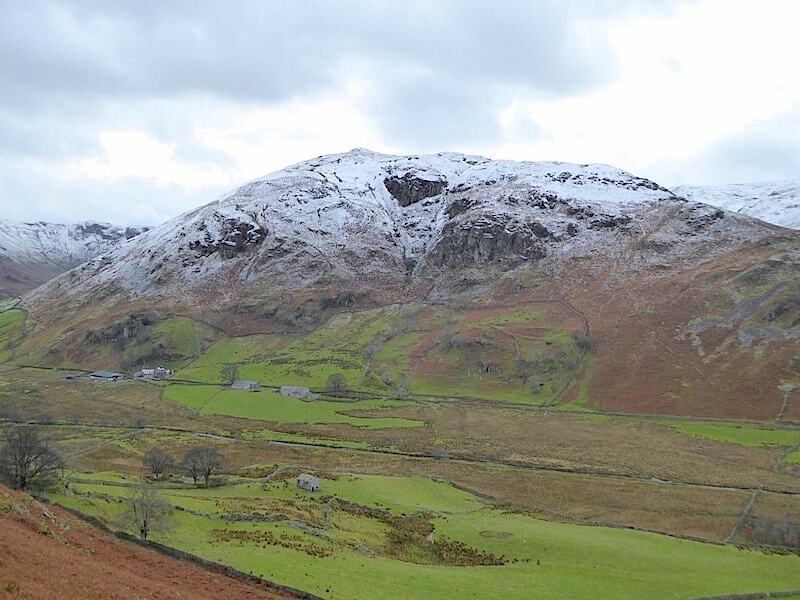 The two parking areas up there were full but there was just one space available so we tucked ourselves into it and off we went, with this view of Beda Fell along the way. Beyond Beda Fell a snowy Place Fell but we couldn’t see anyone up there. 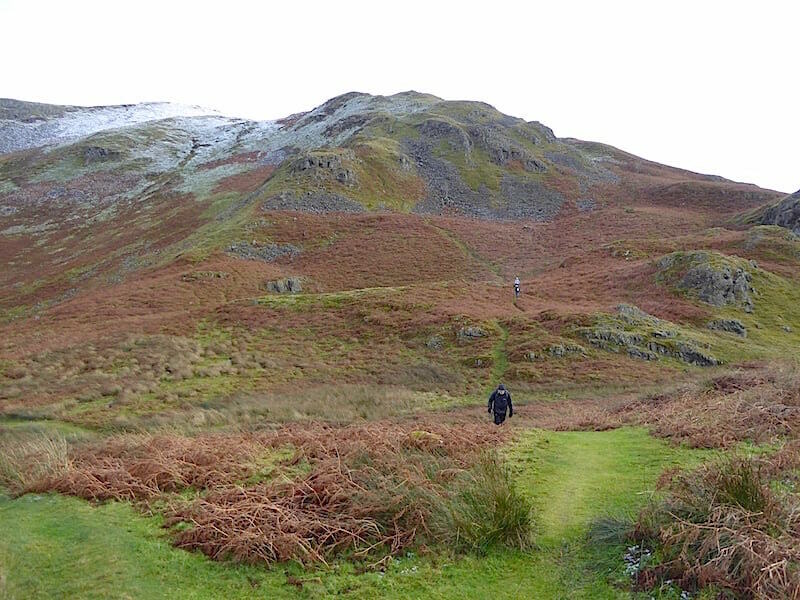 Up the slope and a short distance from the church is Lanty Tarn which seems to have become smaller and reedier every time we walk past it. 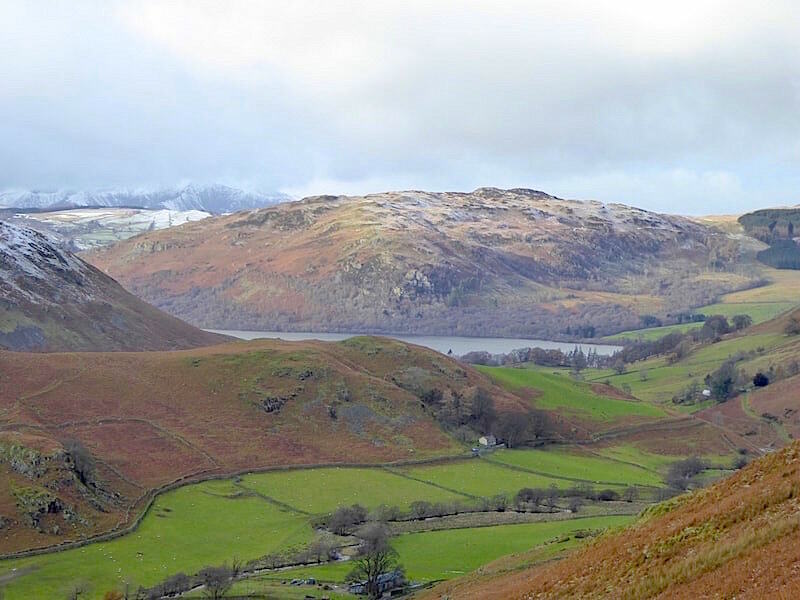 A look back with the merest hint of Ullswater showing below Gowbarrow Fell, and below it the road from the Hause making its way alongside Howe Grain beck over to Sandwick. 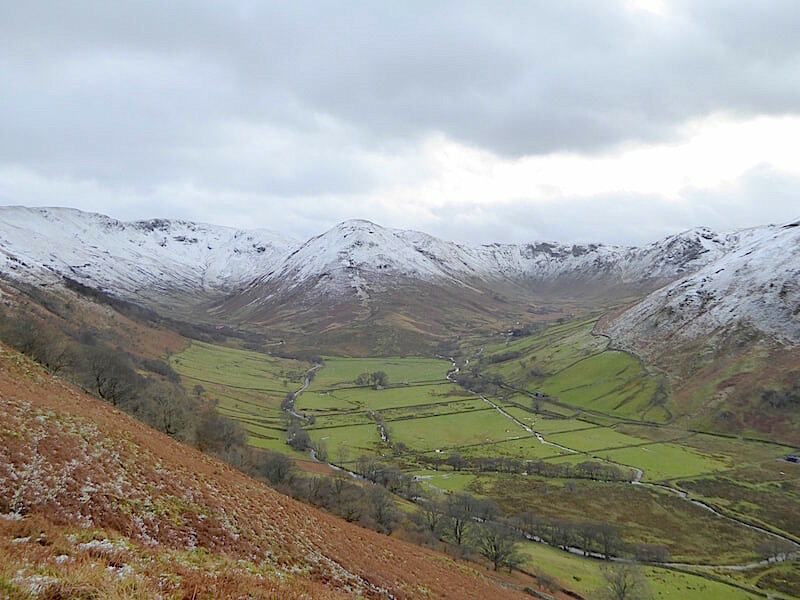 The Nab at the head of Martindale as we use the higher path to traverse the slopes of Steel Knotts. 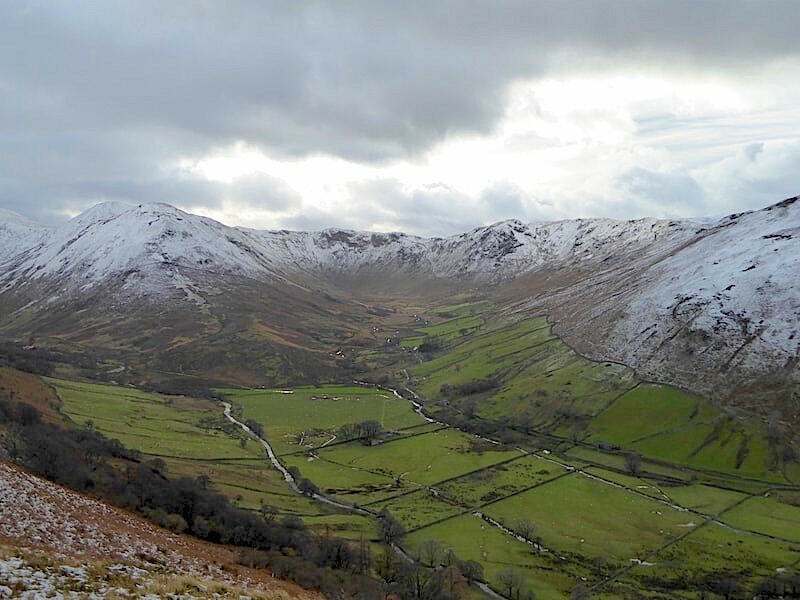 The craggy slopes of Beda Fell across the fields of Martindale. 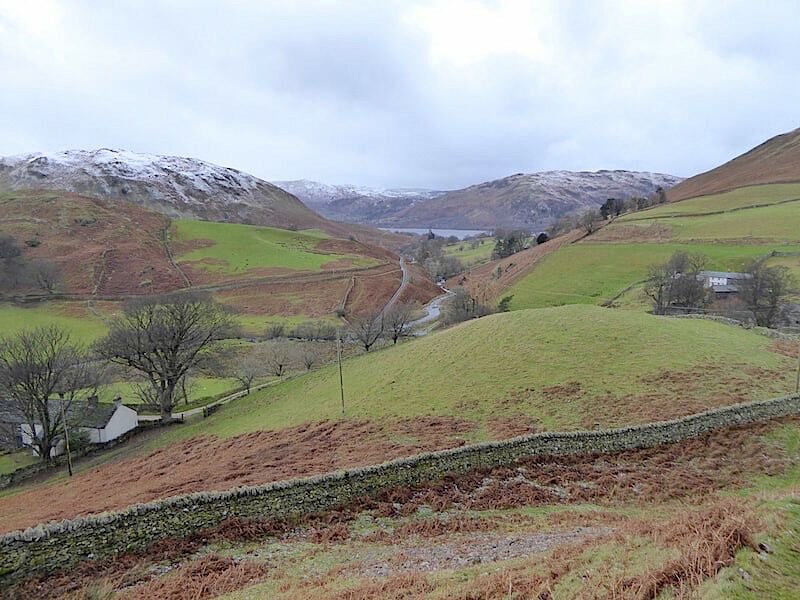 Another view of The Nab which splits the valley into two further valleys, on the left the valley is Ramps Gill while on the right is Bannerdale. As I turned back to the path I noticed about half a dozen deer on the left skyline above me. They had probably been watching us for a while without us realising it and as soon as I turned towards them they turned tail and disappeared leaving me still fumbling with numbed fingers to get the camera out again. I consoled myself with the thought that they were so far away that a very long zoom would have been needed so the shot probably wouldn’t have been a very good one anyway. 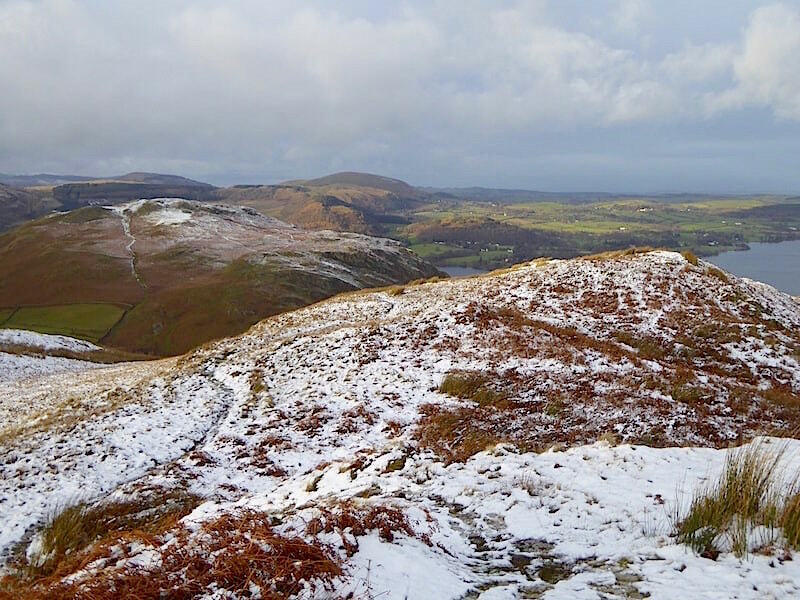 A look back to Gowbarrow Fell as one of the very few brief spells of sunlight landed on it …. 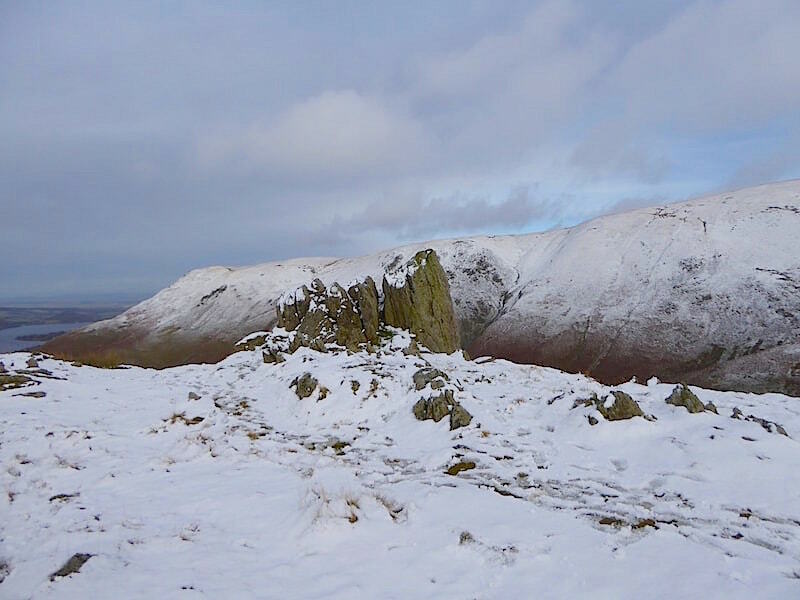 ….. and another look back as we reach the gap in the wall and a chance to scrape off the couple of inches or so of mud and snow which had built up on our boots. The ground wasn’t firmly frozen and the snow was wet and slushy so we had both grown a little taller at this point. 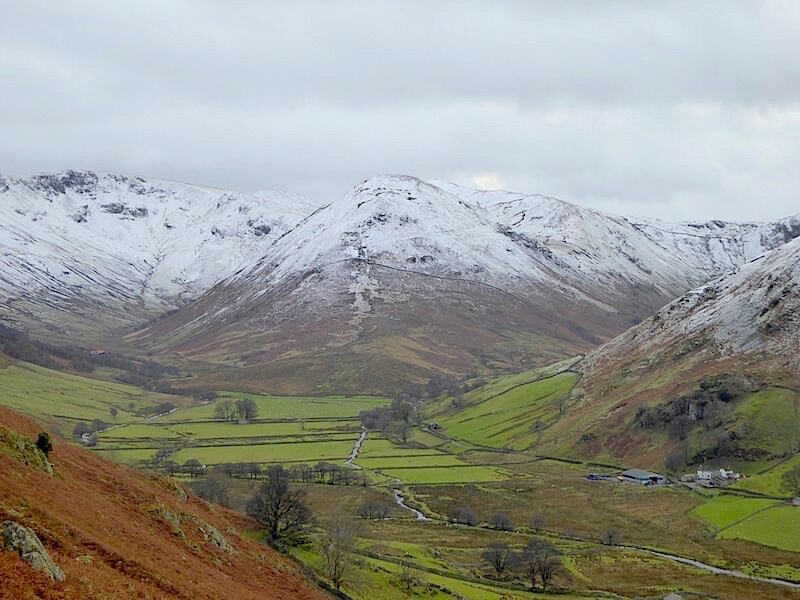 A closer look up into Bannerdale with the dark, rocky faces of Buck Crag and Heck Crag on the centre skyline above the valley. From the gap in the wall the path turns up to the saddle between Steel Knotts and Gowk Hill where we take the left hand turn onto the Steel Knotts path. 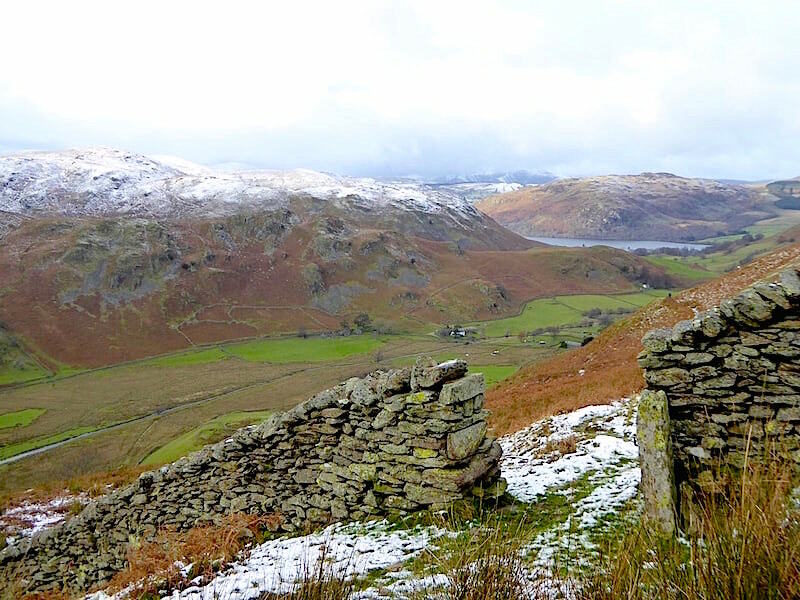 I’ve been reading a book about Cumbrian life as it was a couple of centuries or so ago and the word ‘gowk’ was mentioned a couple of times in it. It seems to be one of those catch all words which can mean something which is unattractive, ugly or possibly a bit gormless. 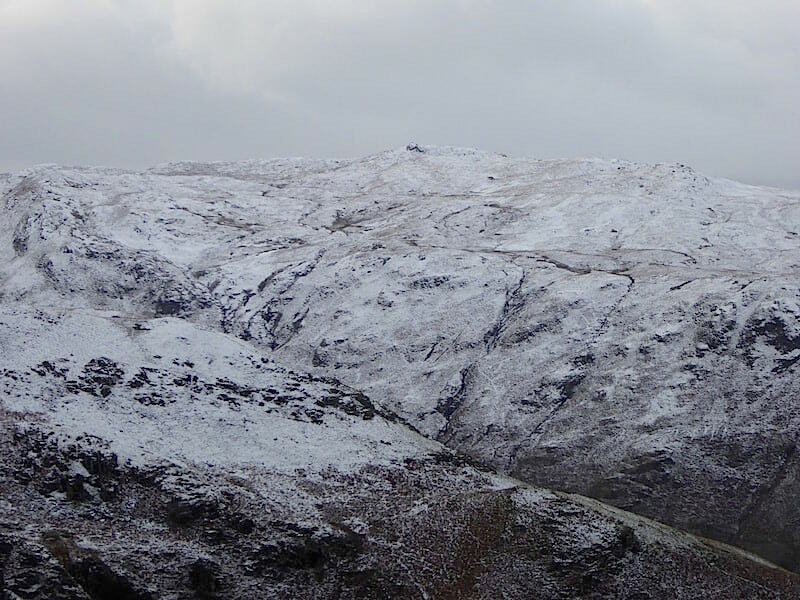 From the path across the saddle a view of Bonscale Pike and Loadpot Hill beyond the wall …..
….. and straight ahead of us is the summit of Steel Knotts. Its not steep climb despite appearances and reaching the top doesn’t take very long at all from here. 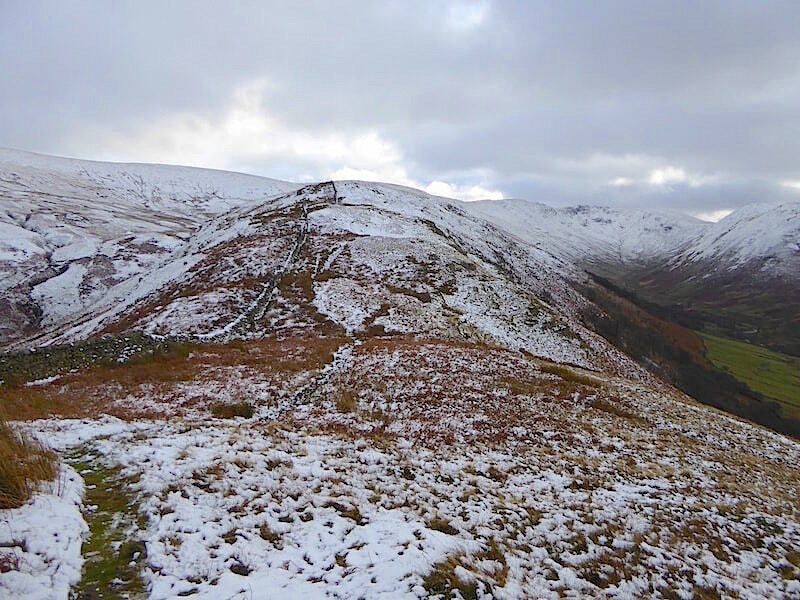 It was just a bit slithery today though on the very last section thanks to the thin layer of wet snow lying on the very short grass but not enough to impede progress to any great extent. 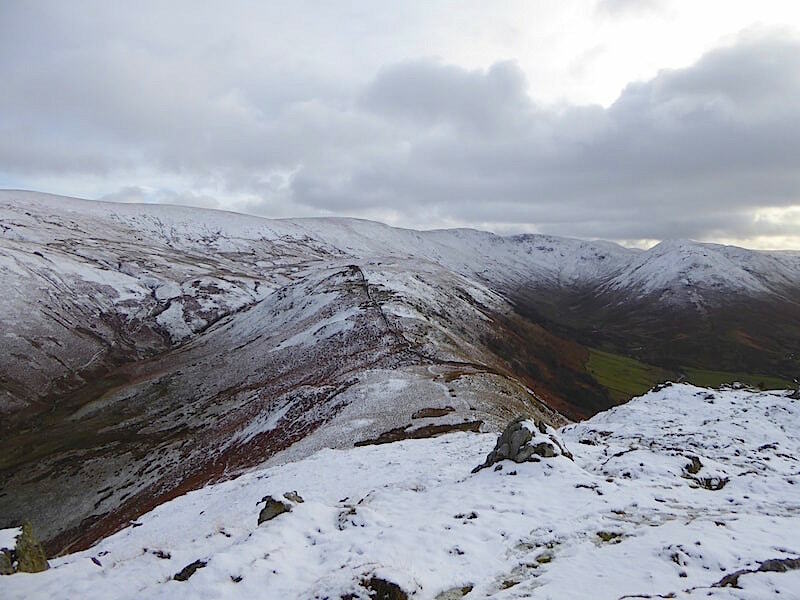 A wintry view to the south east from the very windy summit of Steel Knotts, known as Pikeawassa. By ‘eck it was parky up here. 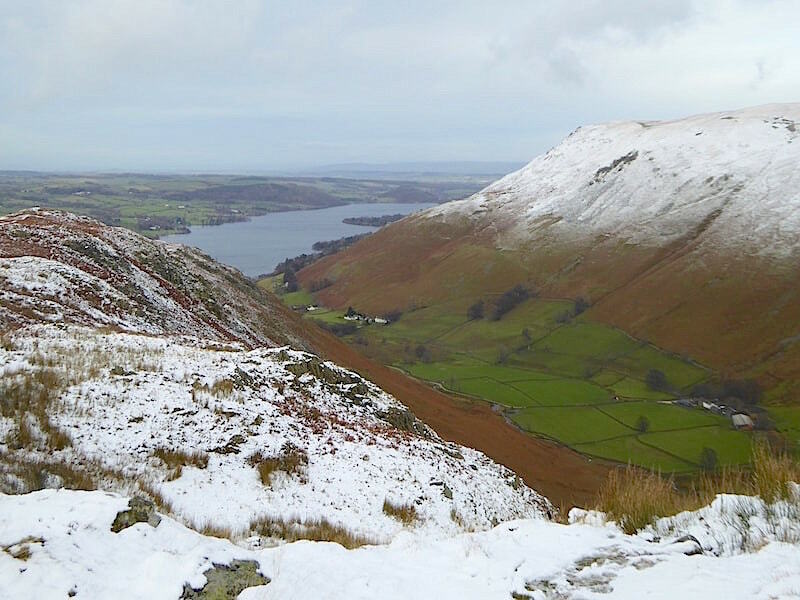 Here are a few more views from the summit …..
….. looking north we have Little Mell Fell, on the left of centre skyline, below it to the left is Hallin Fell, while immediately below us is the snowy path over to Birkie Knott …..
….. north eastwards across the valley of Fusedale is Bonscale Pike and the northern section of Ullswater …..
….. to the west is the rocky summit of Place Fell where there was still no sign of anyone up there …..
….. and to the north west a close up of Blencathra with its head in the clouds but some good detailing on its ridges. We’d already had lunch at home but there’s always room for a Mars Bar even if you do have to stand up to enjoy it and the view. By now I couldn’t feel my fingers so numb were they in the keen wind. 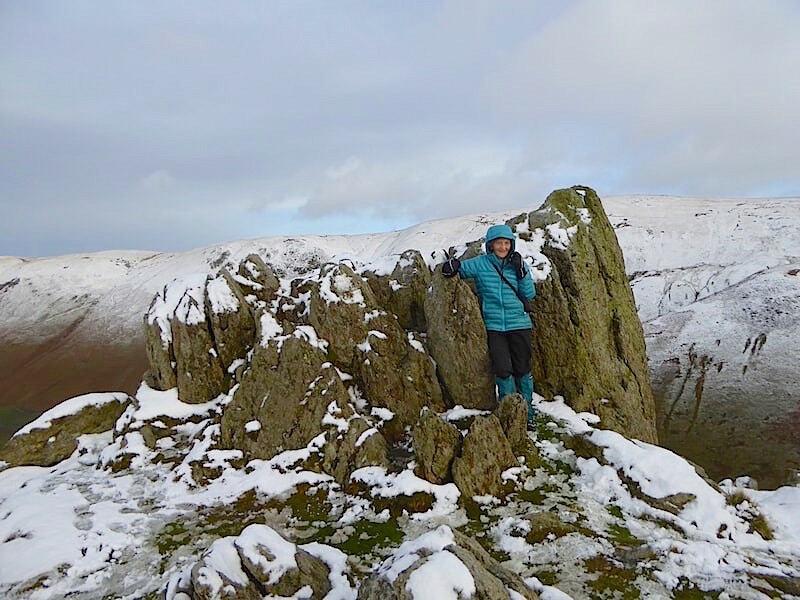 It took me a good while to get my gloves back on too, as there seemed to be a distinct lack of communication and agility between me, my brain and my fingers. 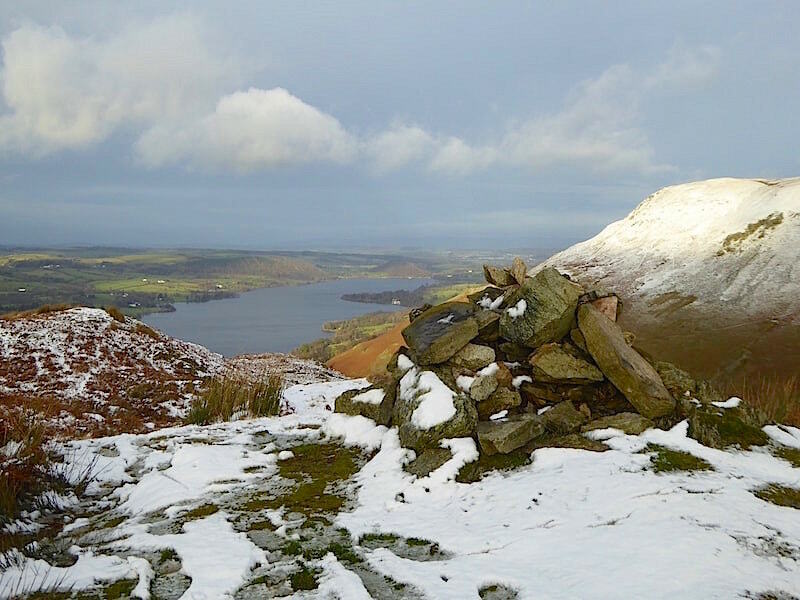 While we standing around chomping on chocolate bars I noticed this sunny spell over on Hallin Fell and Gowbarrow so the gloves had to come off again so I could take a shot of it. The numb fingers returned rapidly. 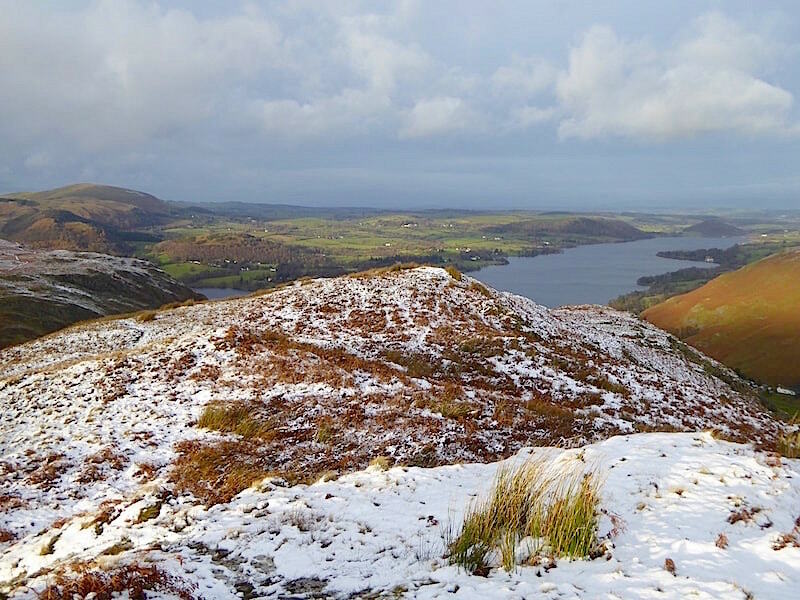 The snowy path up Hallin Fell beyond which are the Great and Little Mell Fells, to the left and right respectively. 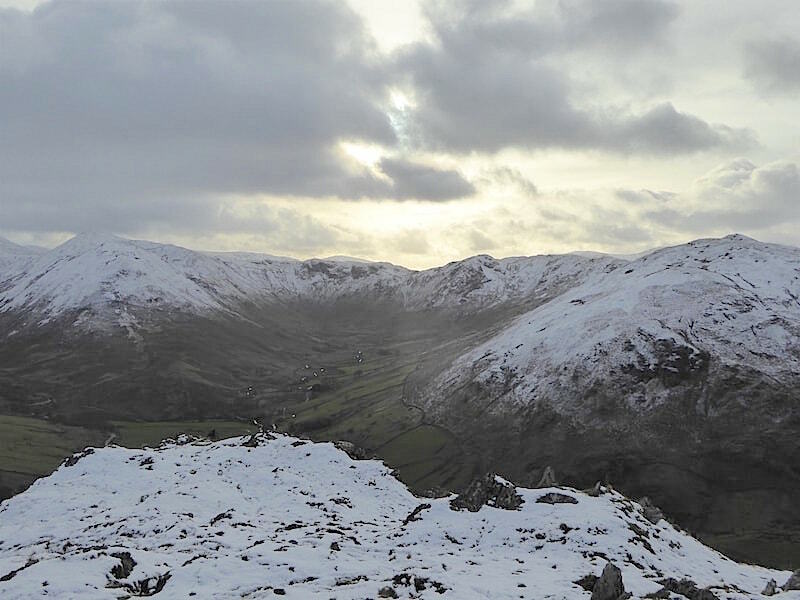 The clouds lift and Saint Sunday Crag appears between Beda Fell and Place Fell, three summit for the price of one then. 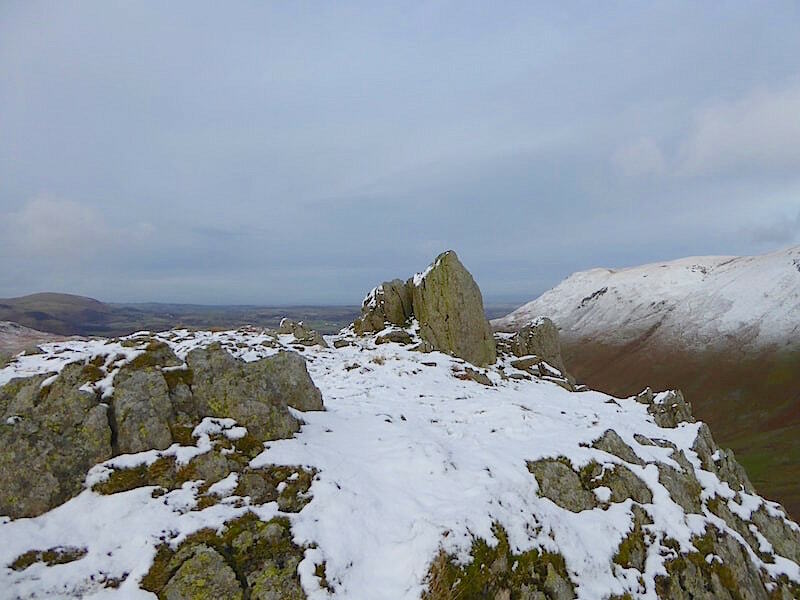 A brighter view of the summit rocks of Pikewassa …..
….. and another one from a different angle. 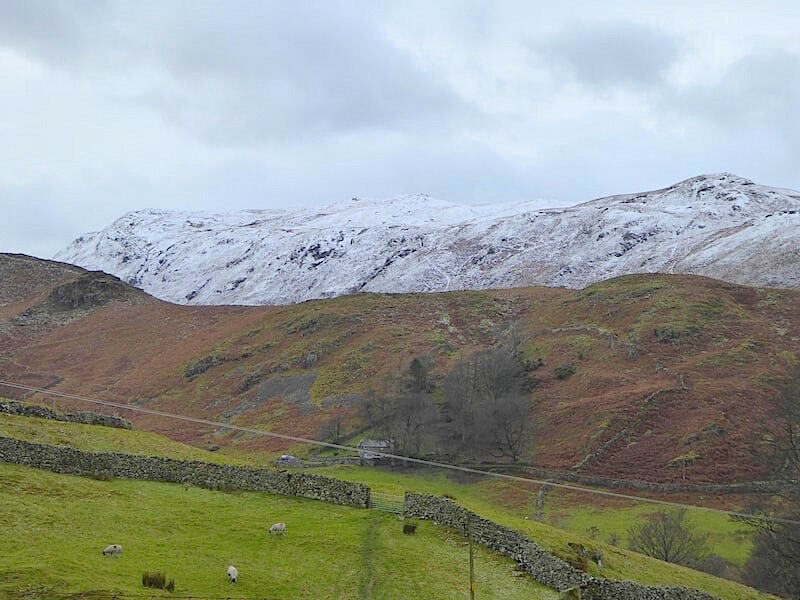 A chilly wintry scene as I take another look along Bannerdale …..
….. and one towards Gowk Hill, beyond which is the Wether Hill, High Raise and Rampsgill Head skyline. Well, we’ve been hanging around here long enough now so its time to get moving again and get the body heat turned up again …..
….. so off we go over to Birkie Knott where another gap in the cloud allowed the sun to brighten the scene for a moment or two. That’s not blue sky over there either, just another high but extensive layer of cloud. The sunny spell lasted a little while so I took a couple more shots while it was there ….. 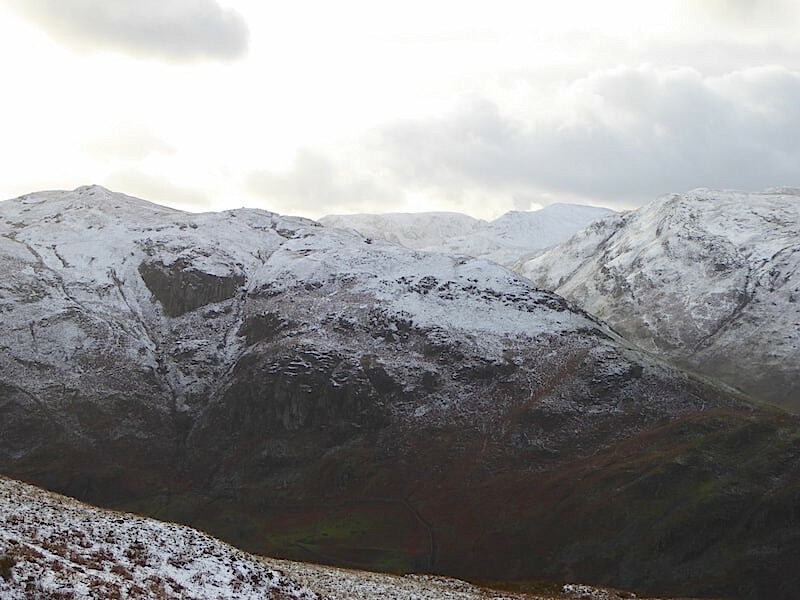 Behind me is the gap in the clouds which was giving us the sunny spell, together with another view of Saint Sunday Crag, now with Fairfield alongside it, in the gap between Beda Fell and Place Fell. 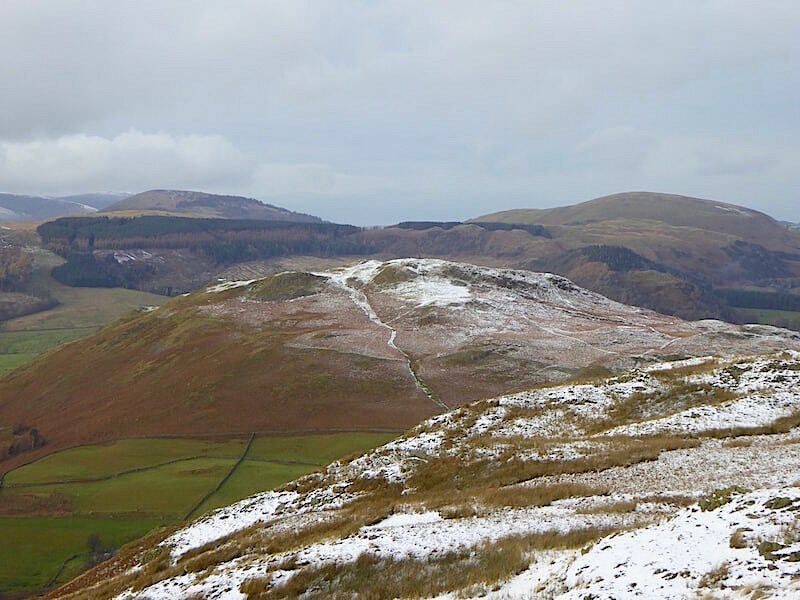 Four summits, more or less, for the price of one this time. 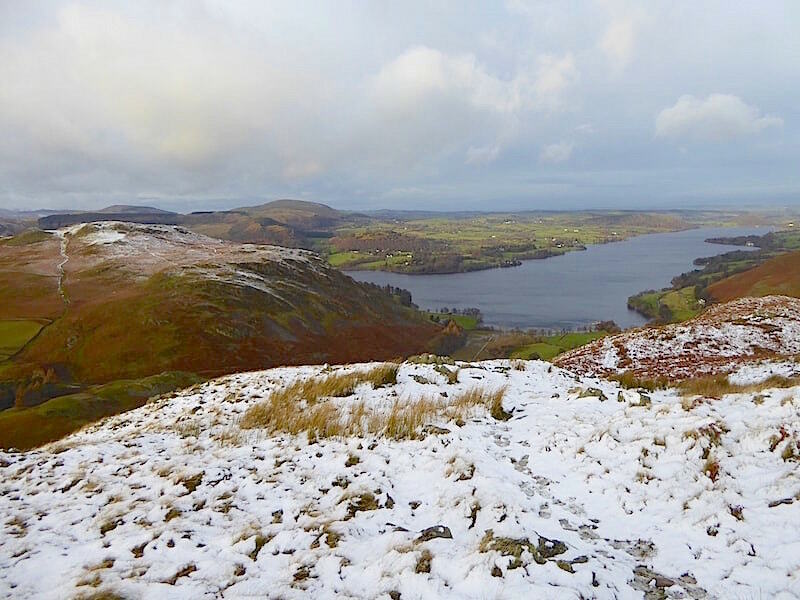 Sunlight along Ullswater as we begin to drop down from Birkie Knott …..
….. while Hallin Fell glows in the afternoon sun. 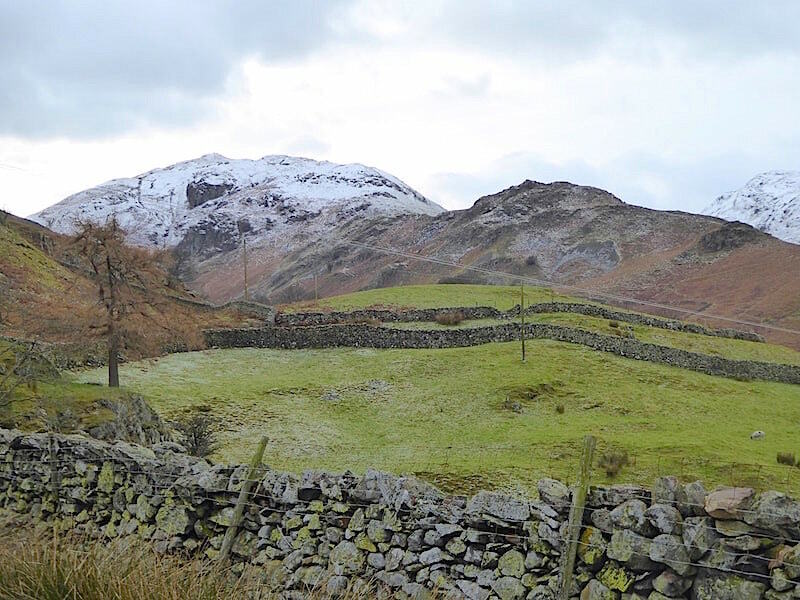 A look back at Birkie Knott as we make our way back to the church. St Peter’s Church, Martindale and we’re back where we started. 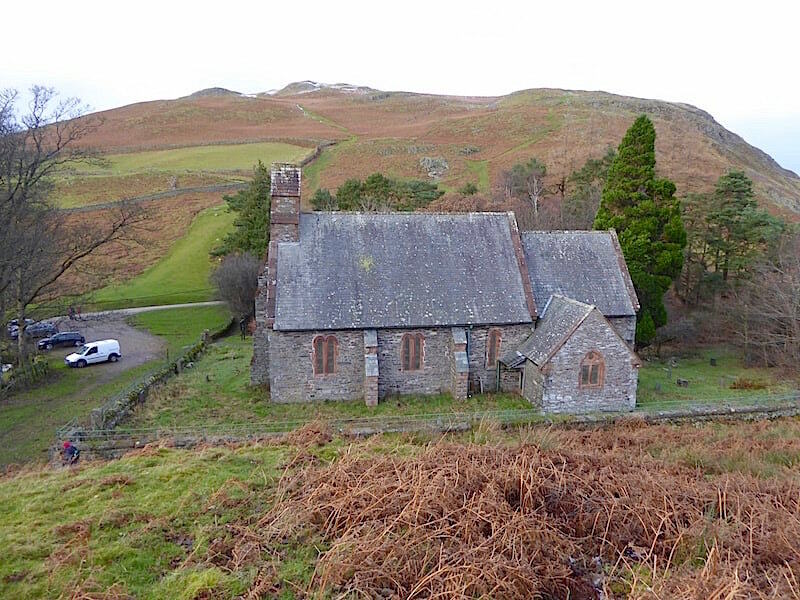 The car park has thinned out although the one beside the road beyond the church was still full. A short walk back to the car, remove muddy gaiters and footwear and then its off home and a much needed hot cup of tea. 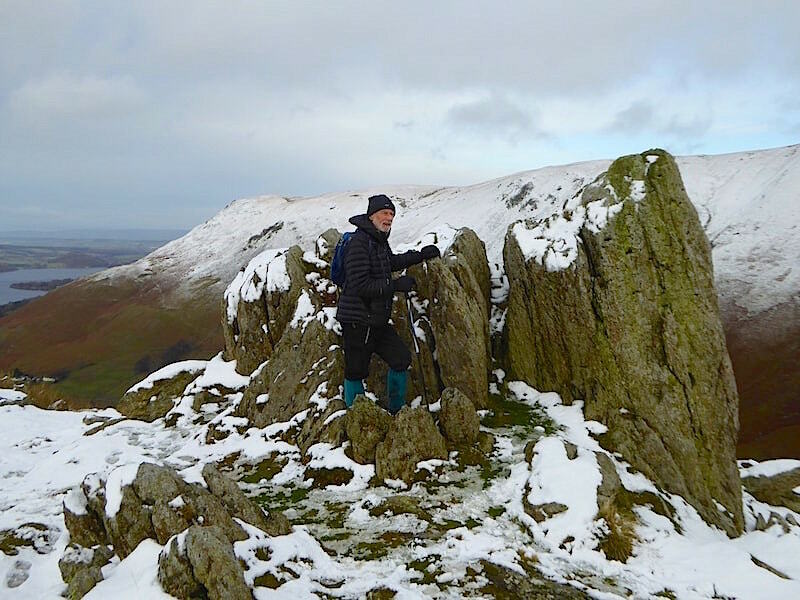 I did this walk by myself on the morning of 14th January this year in very similar conditions, although it was much sunnier, having left J at home largely immobile and nursing a tri-malleolar fracture of the leg and ankle. I think we can safely say that things are 99.9% back to normal again with only an occasional twinge, and no problems at all in the snow today. 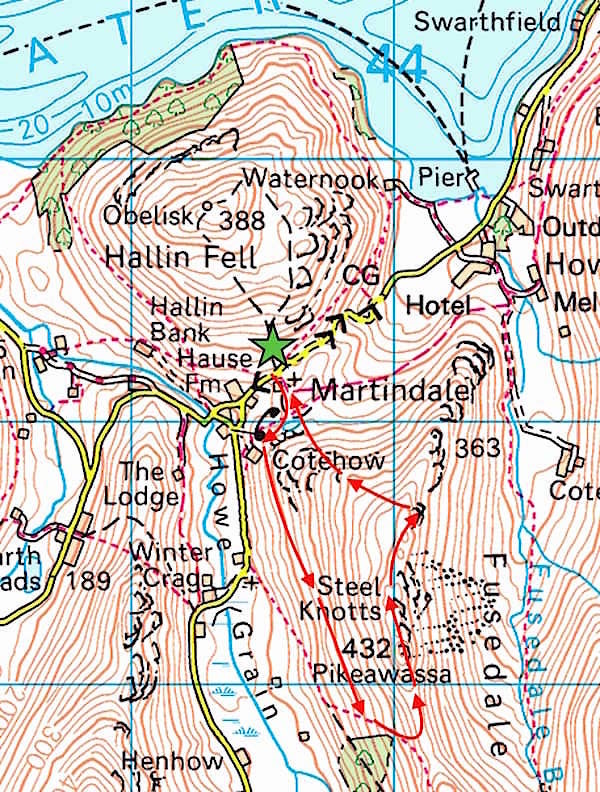 It seems incredible that after decades of hill walking without serious mishap you could take a fall on black ice on a back lane less than half a mile from home. C’est la vie.